I suppose that cliché must always be true, and all good things must come to an end. Sadly, there have been some changes to Kerrygold and their products which means I will be adjusting my grocery list. Kerrygold butter has been a staple around our house for quite some time. It is known in the corn allergy circles as being safe, and it is known in the real food community as being nutrient dense. Imported from Ireland, this popular butter is well known for being grass fed and all-natural. The grass fed part is particularly important. According to the studies of Dr. Price, cows that are grass fed have higher levels of vitamin K2 in their milk, along with several other super important nutrients. So what’s the issue, then? Kerrygold has updated and changed some of the information on their website. If you are budgeting for Kerrygold (like me) in order to avoid food allergies, or to obtain the highest quality real food product, then you may want to pay attention to the changes. It’s not 100% grass fed. It is almost 90% grass fed, and supplemented with feed that includes soy and corn. Yeah. It’s true. Why is this a deal breaker for me? Well, we just don’t eat soy. Soy shows up in the meats that we eat and becomes a hormone and allergy issue in our body. We also have a severe corn allergy in the home, so we are not too fond of even residual corn. And quite frankly I am not going to use up the food budget for Kerrygold if I can get the equivalent cheaper somewhere else. I know. I hear you. 90% grass fed is pretty darn good, and buying this butter on the shelf is also pretty convenient. It has some great nutritional value thanks to that almost 90% of Irish grass, and I might be inclined to shrug off some supplemental organic grain. But I won’t be breaking the bank or running around town to buy a butter that comes from a cow fed soy and corn. It’s actually only 97% GM free. So that soy and corn feed can be from a genetically modified source. And not to argue with the actual website, but it appears that the 3% GM feed statistic is a guesstimate at best. It’s most likely more than that. Perhaps, like me, you thought Ireland and the European Union were still standing strong in the battle against Monsanto. Unfortunately things are changing. Spain has been growing the famous Bt Corn for quite some time. The erosion of Ireland has been going on since 2011. GMO has certainly become an issue in Europe. The argument against GMOs is beyond this little article on butter. But regardless of your stance on GMOs, there is no secret that feeding an animal genetically modified food will provide a less than stellar result. In fact the result could be down right scary. And that is where I draw the line with my valuable food budget and family health. MAN! Are you as bummed as I am? O.K. so there is a silver lining to this. First, my extremely corn and soy sensitive daughter has been eating Kerrygold without visible issue. Alright that is a pretty selfish number one. 🙂 But it means some major healing around here, which ranks a number one for me! Second, other butter alternatives can be cheaper! And who doesn’t like that when working to fund a real food diet? And third, it is one more reason to support a local or domestic farmer which is truly better for everyone. That left me with the question: what do I buy now? Here are some options. The best solution for you is going to depend on personal preference, availability, budget, and location. 1. Source local butter. Use your local WAPF group, Local Harvest, Eat Wild, or farmer’s market to source some high quality, local butter. This is a great way to know exactly what the cows are fed and how they are treated. You may have a hard time finding butter year round and need to buy in bulk during the spring. Or compromise and buy butter from cows that have been supplemented. If they are primarily grass fed and you can confirm the feed is non-GMO, you get to support a local farm and still do better than Kerrygold. 2. Use on the shelf U.S. organic butter, or purchase from a U.S. farm. This might involve ordering online or having it shipped if you can’t find it locally on the shelf. Options for this include Organic Valley pasture butter, Kalona SuperNatural, Natural By Nature, or Miller Organics. Tropical Traditions and Azure Standard are also great resources to check for quality butter. 3. Go with some Anchor Butter imported from New Zealand. This company claims that their cows are grass fed 365 days out of the year, with no supplemental feed of any kind. 100% grass fed. But not certified organic, and can be hard to find. 4. Cook with grass fed ghee, and supplement your diet with High Vitamin Butter Oil. According to the Weston A. Price Foundation, even though ghee is heated it does not lose it’s vitamins, such as the valuable K2. It does lose the Wulzen factor so you might choose to add in a High Vitamin Butter Oil, like those at Green Pasture. As for ghee, I have personally chatted with the owner of Pure Indian Foods. While his ghee is sourced from individual farms, he makes sure that they are all completely grass fed and certified organic. This is some pretty yummy stuff, too. 5. And of course you could always source cream and just make your own butter! I was initially pretty disappointed in my new information, but it seems that losing Kerrygold won’t be the end of the world. In fact, I look forward to supporting some amazing companies who are standing firm in producing a quality product. And I think I may be saving some money, too! Hope is contagious. Pass it on! What are your thoughts on Kerrygold? Don’t forget to share them below! Thank you for contacting Organic Valley. The supplemental grains that our dairy cows may receive include corn, barley, soybeans, oats, field peas and flax. These grains are certified organic and GMO-free. The salt used for Organic Valley products is pure mined salt, produced in the USA. It is high purity, food grade granulated sodium chloride. The salt is processed to remove impurities (such as heavy metals) and crystallized with no additives. Therefore, the salt used does not contain iodine or flowing agents (like aluminum). I hope this answers your questions. If I can be of further assistance, please do not hesitate to contact me. I’m so disappointed! We like Kerrygold butter a lot more than the Kalona plus I can get it a bit cheaper. 🙁 None of us react to it either which is great considering my corn allergy. Some butters have citric acid added which is a corn ingredient. Even organic ones. I’m trying to remember now which one that we tried did. I’ve got most of a case of kerrygold in my freezer but when it is gone I’ll have some hard decisions to make (and that won’t take very long). I’m with you Patty. Disappointing…but yet great that some with corn sensitivity have not shown an issue with it. I’m thinking the amount of feed will only get higher so I am making my switch now. The GMO is where I draw the line. Hmm. That’s disappointing. We used to buy Smor from Iceland, but I had to switch to OV so that I could afford more fresh produce. Three kids and summer fruit in the desert is killing me. I had not heard of Smor. I will add that to my list. I can only imagine the difficulty of finding fresh summer fruit in the desert! Smorg butter is definitely WAP friendly, I think I saw it in the buyers guide too. 🙂 Grassfed goodness. We love it. I hate to say it, but it’s highly unlikely that butter from Iceland is 100% grassfed. Think about it. It’s a very cold country. Cows are unable to graze for half the year due to snow cover. Do you think they are really being fed just grass hay during the winter? Grass is not rich enough to get cows through cold winters. Ask any dairy farmer from a place with snowy winters. They are almost certainly fed silage that includes grains and legumes. I live in CT which is pretty cold in winter and our grassfed beef is 100% grassfed. I know there are farms in WI that operate the same way. It *is* possible to get cows through a cold and snowy winter on just hay. I think you should visit Iceland or read more carefully about the country before you make a broad generalization about it. Hay farming is one of the biggest local crops next to potatoes, beets, and carrots. It’s one of the only countries in the world that have actual cold glacier water free flowing from their taps, and all hot water is 100% geothermal and is actually cooled down to be a sustainable hot water source there. I would bet all the money in the world it is 100% grassfed. Google “Iceland Silage” and you’ll see images of huge white plastic wrapped hay bales. They are everywhere in Iceland. While summer hays like coastal are usually not high enough in nutrition to be fed solely all winter, that is not true of hays grown in colder climates. Timothy can be very high in nutrients. A combination of alfalfa and timothy is what is fed to the most valuable racehorses (not solely – but they are in heavy exercise unlike grazing cattle). Most “hay” isn’t just grass hay. Products designated “grass fed” can be from cows fed grass hay, but also alfalfa hay (very high in protein and calcium) and silage, which is typically made of corn stalks rather than grains. By definition silage is made from green matter, not just grains. In terms of corn silage, the corn is in its grassy stage (corn is actually a grass!) and the proportion of grain to stem is optimal as natural forage. I lived in a very temperate part of Europe all winter. The cows graze all year. 100%. Correct me, I may be incorrect, but Greenland has very cold wintry weather, Iceland is mild by comparison. When we were in Iceland a few weeks ago we saw many farms where the hay rolls were covered in a plastic cover. It made the farms (which were dairy or sheep farms, not much else in Iceland, fruits and veggies are grown in geothermally heated greenhouses) look like marshmallow farms (you can find photos easily online). I asked why the covers on the hayrolls and they said it removed the necessity to bring the hay into barns in the winter so the animals had forage the year round. So I think their percentage of forage fed dairy is pretty high. Not a scientific evaluation, of course, but it sure seems possible. There are grasses that can carry cattle and horses through hard winters. I use them. Alfalfa, timothy, clover mixed with fescue. If we have a sick animal they only get rolled oats added. Do you know if Smjör is available unsalted? Where can you buy Smor? Can’t find it. It seems to be sold only (as far as I could see) at Whole Foods stores, but none were listed for the southeast. I live in Georgia. Does anyone know any other place to get this or if it can be ordered online from someplace? Hmmm…. despite the disappointing information, I’ll likely continue to budget for and buy Kerrygold. I agree that organic is better than conventional, but when it comes to butter, I believe grass-fed is better than organic. There are huge benefits to grass-fed butter than I’m not willing to concede and spending $12/lb on the Anchor brand from New Zealand is just not in the cards. I did a side-by-side comparison of Kerrygold and organic butter and Kerrygold was SO much more yellow, showing the higher concentration of essential nutrients. I’ll never go back to conventional after seeing that, and it’s even difficult to want to use organic. I haven’t been able to successfully source local butter or cream either, and we’ve eliminated nearly every possible other source of GM corn & soy from our kitchens so at this point, even if the estimate is low at 3% GM, Kerrygold is still the best bang for my buck. Thanks for sharing the information Nichole! I think more and more folks are moving to the fresh, local, know your source food. One of the main reasons we started raising our own cattle & sheep. Thinking we may need to start milking one of the cows though. LOL, oh how I wish we could buy land! That is much easier said than done. We live in coastal CA and the cost of land is astronomically expensive. We’re surrounded by farms for sure, but they’re operated by farmers producing for the mass industry. Believe me, I’m hitting the beat at markets, talking to people to get more inside information. I recently found a source for affordable raw milk ($7/half gal) and just that took several months to discover. Until I have my own cow and can make my own, Kerrygold still wins. I’m in CA as well. In case you decide to look for an alternative, Anchor Butter and a local WAP butter buy have ended up being comparable in price to Kerrygold at TJ’s. I’m with you on this. I’m southern coastal Calif. I pay $15 for a gallon of milk. I will have to stick with Kerrygold until I find a better source. And believe me, none of my friends, could care about their butter. Let alone buying property and putting cows on it. We did consider just that, but it’s not going to fly. Good distinction to note. I’ve never seen the British version of Anchor sold in the States, but it is definitely something people need to keep in mind. Always Read Your Packaging! Your ‘final’ dairy products may be GM free but can you confirm that the grain/supplements fed to your cows are GM free? The last sentence in the response is: We can confirm that Kerrygold butter and cheese do not contain GM ingredients. I hope this is true! We love Kerrygold here. I buy it at Costco. You have to be careful with the wording here. The Butter, of course, doesn’t contain GM ingredietns, it contains only ‘cream’ (or cream and salt) as ingredients. It’s the source of the INGREDIENTS at question here. Butter doesn’t contain soy or corn as ingredients, but the cows that produced the cream are consuming corn and soy. Hi Sarah! You are correct the direct ingredients are not GMO.You may be interested in knowing that what animals are fed actually shows up in their meat, in their milk, etc. That’s why for us we don’t do GM in any form, even animals fed it. You can read about it in the article I wrote linked below. “Your ‘final’ dairy products may be GM free but can you confirm that the grain/supplements fed to your cows are GM free? I asked Kerrygold USA the same question, and the reply was that they do not add any GMO products to their butter, and they refused to confirm GMO-free feed for the cows, citing the cold winters and other silly reasons. Their entire email response to my questions seemed to be very evasive and full of technicalities, just like above “Kerrygold butter and cheese do not contain GM ingredients”, meaning there are none added in the production. I quit Kerrygold butter the same week and am still looking for a replacement. Thanks! We love it too! We purchase it at Krogers. Same here, Patricia. I think I will stick with Kerry Gold from Costco. There may be better out there somewhere, but this is a WHOLE LOT better than the butter in the grocery. I live in rural Ireland and the article is correct. Cows both beef and dairy are kept in sheds from about september to april (they are only back in the fields last week). During winter they are fed 90% grass silage collected by the farmers from pastures. The cattle are supplemented with cattle feed which is milled from corn, soy, minerals and vitamins. I have been to a feed mill and seen pallets of US GMO corn and soy. I asked the owner is it all GMO and he confirmed that it was GMO and that only a few of his customers ordered non-GMO as it was much more expensive. So there is a small element of GMO in the “100% grass fed” Irish butter. Its still a great product and probably the nicest mass produced butter in the world and a vast improvement over your 100% corn fed butter in the US. I think you’re missing her point a bit… when a child has a SEVERE type of food allergy where they react to corn or soy that the cow ate, and then the child ate the butter from that cow and got sick… that’s severe and life threatening. The point of her blog and her entire site is to help other parents going through FPIES to understand why our children are still sick even when we think they are free of these ingredients. She provides a lot of great information. It’s not about whether the butter from iceland is better than american butter. It’s about sourcing a product that is truly 100% grass fed, and nothing more. Exactly! I’m allergic to many antibiotics, which used to be like playing roulette when eating meat. I am also highly allergic to peas, which can be hidden in so many things. Vegetable broths/proteins are pretty much out unless I know for sure. I also recently discovered that many of the vegetables/fruit that occasionally bother me are due to the pollen being absorbed through the skins. Now I avoid fall harvested crops, made a huge difference. I’m just thankful I get through spring/summer with out issues. Me and fall are not friends lol as all my pollen allergies are in Autumn. what does Costco charge for Kerrygold butter? Dairy cows eat 40-50 pounds of dry matter a day….so 3% could be Non-GMO corn….even if they ate 10% of that as their daily diet, it’s 4-5# a day….a lot of fuss to me over not much…. I’ve seen anywhere from 50-100 pounds per day of feed. And these guys are saying that 90% of the feed is grass, so that’s 90 pounds of grass, 10 pounds of grain per day (on the upper end. So out of that ten pounds of daily grain, 3% is GMO, so that is ONE THIRD of a pound of GMO grain per day. One third times 365 is 109.5. One hundred nine and a half pound of GMO grain per year. LAAA TEE DAH! I don’t see the big deal either. Somebody correct me if my math is wrong. I’m not a mathematician, but I sure don’t see the problem here. Irish butter is the best. OK, this may be TMI, however, as a nursing mother, if there was ANY milk in anything I ate, my son would start screaming after nursing. If the 6th ingredient listed on the cookie bag, in just one cookie, was non-fat milk powder, BAM! So what the cow eats does come thru in high enough concentrations, no matter how much the cow weighs or what percentage of the total diet the “GMO is. One needs to remember that cows have four (4) stomachs. They can eat rotten and or mouldy food and it is processed out by the time it goes through their 4 stomach system. I will stick with Kerrygold, as silage does not mean grain, could be mostly hay mix. And it’s the best tasting I have run across. Nope. Cows cannot be fed rotten or moldy feed. Try it and you will end up with sick or dead cows. You’ve made a good argument for avoiding any dairy in the mother’s diet if the breast-fed baby has a dairy allergy, but it doesn’t necessarily follow that traces of GMO feed in butter is an issue; dairy *at all* is the issue in your example. Jeanmarie, you clearly don’t have a child with a medical condition like FPIES, so unless you’re an under-educated doctor, you’re wrong. My kid has FPIES and reacts to grain fed dairy, but not grass fed dairy. The world is changing, bad enough for children with rare and dangerous medical conditions to have to change their diets this extreme in order to survive. This is a reality for many families, not some made up internet wives tale. The issue is feed in general causing the issue. It’s very real and very much a possibility for children to be allergic to specific strains of grains (kids allergic to red grapes but not green for example… just an example) the same goes for GMO strains. I have noticed that the recent block of Kerrygold I bought wasn’t nearly as yellow as the pasture butter I bought from Azure. I found it interesting. Is there a specific brand on the Azure website that you are buying? I just saw all the bigger name brands on their website, except Rumiano, which there isn’t a ton of info about except that it says”pasture butter” in the description. Is this the one you are using? Do you have anymore info on it? I’d also like to know what kind of butter you’re buying from Azure. I order from there and would love to find a cheaper pastured butter! I know! We supplement alfalfa for our chickens and are faced with this, and I keep hearing about the difficulty of finding non-GMO alfalfa from local farmers. Luckily the organic label requires that the cows milked for butter never be fed GMO, so you know it can be avoided. It is NOT certified organic. I buy the Rumiano butter from Azure. I did a side-by-side comparison with organic valley butter and the OV is WHITE, the RUmiano is egg-yolk-yellow. That was enough to convince me. Color has to do with season. Grass/hay based dairy will always be white in winter. I’m surprised to read this. I’m thinking that the yellow color is due to the carotinoids (of which beta-carotene is one). I’m surprised that hay would not have the same effect on the butter as grass in terms of giving it color because if hay has been cured properly it’s still quite green. Azure’s good butter is from Lifeline Dairy in Montana–local for me. Lifeline is very into putting out top quality meat and dairy products…and, even though they sell vat pasteurized milk, they are staunch supporters of legalizing raw milk here. And their butter is second to none. I can go to the creamery when I get down that way and get butter ends and pieces for $4/pound! Finally someone noticed the same thing. I’ve been buying kerrygold for many years now, but the color has been a much lighter yellow ever since last year, after Costco started selling it. I thought the difference is because they were from costco (lower price, lower quality), but I went to Trader Joe’s straight ahead to do a comparison, it turned out that the color is the same! I guess once the mass market like costco jumped in buying it, the Kerrygold company had to grasp the opportunity and abandon their principle. BUMMER 🙁 We recently started buying Ruminao (spelling?) from Azure Standard. The package says its from grassfed cows in California. Its just as yellow if not more yellow than kerrygold. Best Part is that it is about $3.50 for a whole pound! What! That’s amazing. I thought they only did cheese! Sounds good except, what is the natural flavor in their ingredients list? oooh is that Ruminao? Does it list a natural flavor? That would be an issue for us. Well, from your update now I don’t know if I want to be buying Organic Valley, either! I want 100% grassfed butter. Isn’t that perhaps false advertising to call it ‘Pasture Butter’?! If it’s not ALL pasture?? I asked both companies. It seems Organic Valley feeds more grain, less grass than Kerrygold, so I’d go with Kerrygold over OV. I stopped buying Kerrygold in the UK some time ago because they had changed it. I don’t quite know what they did to it but they made it softer and advertised it as ‘spreadable’. The new softer, spreadable Kerrygold doesn’t taste as good IMO and I am suspicious about what they did to it to make it softer. Now I buy a locally sourced organic butter. I actually wrote to Kerrygold and complained when they went to this “spreadable” tub butter — horrible off’ taste! They answered that it was still entirely unadulterated — but I found it tasted disgusting! I begged my local grocery to quit with the horrid tubs and go back to carrying Kerrygold stick butter, which they finally did! Complete bummer! I made a switch to Organic Valley Cultured Butter and it’s delicious but much firmer than Kerrygold… Maybe they will turn back? Why do you need added fat? I eat paleo but lots of paleo carbs. My fat is from grassfed beef, lots of whole fish and eggs. You don’t need to add fat to your food. I can’t begin to understand why you think you don’t need to add fat to your food. It’s critical to have plenty of healthful natural fat in the diet, fat from whole, healthy sources. High protein without sufficient fat in the diet will deplete vitamin A. There’s a fatal disease known as “rabbit starvation” if I remember correctly that results if too much lean protein is consumed. Natural animal fats are sources of the most critical vitamins, A, D3, K2. Not everyone likes or tolerates butter, but saturated fats are definitely needed and can also be supplied with coconut oil, in addition to the fats naturally in meats, eggs, etc. Carbohydrates also have their place, as of course does protein, but that’s something that can easily be overdone. Fats? No, not really, as long as you get sufficient protein and a bit of carbs (individual carb needs will vary). I think we all have to do the best we can do in this imperfect world. Not everything works for everybody and some substances are not completely avoidable! And a lot of us are on a budget out of necessity. You can find her by googling the farm name. She ships butter and cream. I have moved out of her delivery area, alas, and had to cancel my herdshare membership. But I still dream about her wonderful products! FYI…she uses just enough grain to get her cows to look forward to being in the parlor. You will need to ask her what’s in her feed if that concerns you. Darn, I love the taste of butter. Fortunately, I have an abundance of another fat, lard, from a pig we slaughtered. I am on the fence about Kerrygold now. I can sometimes obtain butter from the Amish, mostly pasture, but supplemented at milking time. No GMO free guarantee there, though. I am looking at their FAQ page and I don’t see this information. Can you point me in the right direction? “Like so much of what we do, our feeding pattern follows the cycle of nature. During the winter, when grasses stop growing, Irish cows are fed dried grass (known as silage). This grass is grown throughout the year, cut fresh and stored to be used when the winter comes. Cows in Ireland calve in the spring and are therefore outdoors, grazing on green grass when they are producing milk. After calving, cows are provided with supplementary feed to help restore protein and nurture them through this period. Just an FYI for those who might be interested. Both of the Walmarts near me carry Anchor butter. It costs $3 for half a pound. I try to avoid shopping at Walmart, but sometimes I need butter and can’t get to the health food store, and I usually can’t afford to buy butter online. I actually prefer the taste of Anchor over Kerrygold. Ireland banned the cultivation of GMO crops back in 2009… it would be surprising that farmers would even have much access, if any, to GMO grains for their animals in Ireland. Thanks for researching this. I had a feeling that this was too good to be true. I kept telling my son that it seems that they do the right things (I don’t say anything with absolute certainty unless I know the facts personally). Unfortunately, local is probably not going to be cheaper, unless your local milk is cheaper. It takes a quart of cream to make about a pound of butter. It takes about 2 gallons of milk to make a quart of cream (give or take on the season). I pay 7.50 for a gallon of milk, 13.25 for a quart of cream and 14 for a pound of butter. KerryGold was the savings for me. Guess I’ll be going to ghee, coconut oil and the occassional homemade butter. Bummer! Thank you so much for this information. I have shared it with the Nourishing Our Children and Nourishing Ourselves communities! Thanks for the share Sandrine! Hi Pat! That’s is a great proactive idea! just wrote to them. I buy several hundred dollars of their butters and cheeses and on principle alone, I won’t buy Kerrygold anymore. Don’y call it grassfed and squeeze in corn/soy. They lost a lonnnnng time customer. FYI: I found the anchor butter at Walmart. 1) The cows are on pasture 312/365 days. That’s a LONG TIME for grass-fed cows, and longer than they do it in Iceland (smjor), Switzerland and Holland and other traditional dairying cultures. Further, those 2 months they’re not on pasture would be winter, a time when it’s traditional and normal to keep them inside. Also, it’s likely the cows are pregnant and not lactating at that time, so you wouldn’t really be getting the milk from when they’re inside anyway. 2) It’s pretty typical to feed dairying animals a small supplement of feed (my local dairy is 100% grass-fed, but that’s rare). 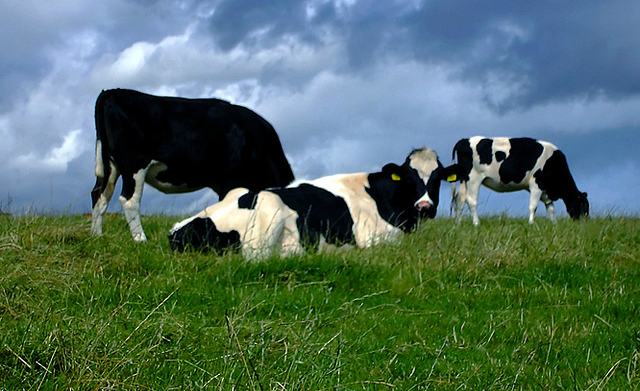 Most grass-fed dairying animals get supplemental feed either in winter or at milking. Kerrygold feeds silage/hay in winter and a small supplementary feed of MOSTLY barley/wheat at milking. Again, totally normal and totally traditional. 3) It is also REALLY difficult, if not impossible, in some areas to find supplementary feed that is 100% GMO-free. And, again, the majority of the limited supplementary feed the cows get *locally grown* wheat and barley. When you abandon companies like Kerrygold who are promoting and providing what we stand for, but aren’t 100% perfect, you fail to support the very people we need to make the movement viable. In the end, there’s no GMO ingredients in the butter or cheese. The cows are on pasture except in winter (when they wouldn’t be giving milk anyway), and it’s an ACCESSIBLE food for many people since you can find it in most grocery stores. Thank you for your comment, Jenny. You are right; it is pretty normal to supplement feed a dairy cow. Yet there is nothing normal or traditional about feeding a cow soy or GM feed. I appreciate Kerrygold’s transparency with this and attempt to maintain a quality product. But that is not a reason to not share information with those who are extremely sensitive or chronically ill, many *because* of soy, corn, and GM feed. This could be the reason some think they or their children are not able to tolerate butter. I don’t believe their choice to avoid a product so that their child will not land in the ER is abandonment. I agree! Holding good companies to impossibly high standards is kind of self-defeating. I will continue to buy Kerrygold as it’s by far the best option that I know of in my area, but I will also now look for Humboldt Creamery (the next county over, so I’m sure it must be somewhere around here), Rumiano and Anchor. Thanks for the information. I just emailed KG thru their website also and left them the URL of this blog. I hope they will read all the comments and realize they need to get back on the straight and narrow. If the cows were being supplemented with non GM feed I would agree with you that it is not so much to worry about but it is actually GM feed that is being used. No-one knows what possible harmful effects there can be from consuming products from animals fed GM feed. I’m afraid that what has happened with Kerrygold is part of a bigger picture of what is happening in the UK, Ireland and Europe. Sorry to hear what is happening in UK re gm/gmo.. it is a huge battle here in US, made impossible by our big govt who loves to make deals with big biz.. it’s called fascism. But the bottom line here is that big govt will not change until made to change, and too many of the people don’t even know there is a problem, as they get their news from the corrupt msm. Everyone is assuming it’s 10%. We should see the legal definition of almost 90%. Bet you it means 85% or maybe even less, grassfed. I will continue to buy Kerry gold because the next possibly best thing is out of my budget. I don’t grill the staff about GMO ingredients when I go out to eat; i accept that there is likely a small percentage at least in there. We do three best we can and I’m glad that kerrygold is available in my area for a very reasonable price. Until i can have my own cow and make my own butter, I won’t be able to afford better. There’s a saying out there… Don’t let the perfect become the enemy of the good. Kerrygold is delicious, readily available, a great price and full of nutrition. It’s not “perfect”, but it is really, really good I’m going to keep on buying it and their delicious cheeses too. Anchor butter is now unfortunately produced in the UK, not New Zealand. Read the comments and they seem to indicate the quality has suffered. Please link to the Kalona Supernatural site in your blog post. I love their cottage cheese and look forward to trying their butter! I’m sorry about the link Sondra. I think it is fixed now. And that is really stinky about Anchor butter. I will need to check into that further. I have heard that Kalona is really yummy. Hi Sondra. I wanted to follow up on this and let you know I (and another GAPS mama) looked into Anchor Butter further. They have a ‘franchise’ of sorts in the UK that produces a butter under the Anchor label. It is not guaranteed 100% grassfed. If you are in the States, the Anchor Butter imported here is in a blue box from New Zealand, and completely grass fed. I am completely in agreement with you. 100% grass-fed organic is best, but in the absence of 100% grass-fed, I will always choose GMO-free / certified organic. It’s not just for health reasons but I believe GMOs are harmful to the planet (bee-killing pesticides are used to treat GMO corn seeds), harmful to our democracy, and harmful to our basic human dignity by the patenting and corporate control involved. Thanks so much for sharing this very important information in this post!! It all started with eggs,,I asked all the farmers of my area,do they get any feed?? all answered yes,we must(not true) ! in the winter and the end of day..what is in it? grain!!! !So if I am to pay 4 or 5 dollars for free range chicken eggs,I want the enf product to be free of GMO,s right? Now I get farm fresh end of day grain fed eggs for 3.00 dollars..why pay for GMO,S?? So that 3% isn’t just putting those soy and corn allergic people at risk, it is putting us ALL at risk. I can be wrong (wouldn’t be the first time), but when I went to the Kerrygold site, I didn’t see mention of corn as one of the supplementary feeds. Also, just after calving, when most of that feed is given, cows are usually not milked for people (I’m guessing this is the same for Kerrygold-as implied in the FAQ page). Finally, while they may contain some GM soy in the 3%, they also mention (definitely worth noting, as it shows their good intentions) that navigating around GM feeds is a new thing to them. It sounds like they are working to have 0% GM possibility. I think that still deserves support and not boycott. Also, posters here have mentioned that those with severe corn and soy sensitivies have not had any reactions- isn’t that worthy of note? Finally, I can tell that Kerrygold is better than Kalona natural (have had both) and others. That’s just personal, anecdotal. I will stick with my biofeedfack on this one, and not damn the company because they aren’t able (yet) to be 100% GM free. I have been writing to UK supermarkets and asking them why they are no allowing meat from GM fed animals to be sold in their stores and the answer I git from one of them is that their suppliers are finding it harder and harder to find non GM soy and corn to feed the animals and therefore can no longer guarantee that their produce is completely GM free. This could be seen as a cop out or as GM being allowed in through the back door. However, one thing I think it does show is that our fight must be against the GM manufacturers and growers if we want change. sorry about the terrible typos! I always wonder on Organic Valley if they are talking in particular about their advertised PASTURED butter or their other organic butter? Because I buy their “grass milk” too and wanted to make sure it was 100% grass-fed. I am assuming it’s the same dairy in their pastured butter. But I buy Kalona Super Natural butter. I need a comparison report on the grass-fed dairy choices!! Honestly, the amount of time wasted in this thread is ridiculous. Read the FAQs again. Nothing about corn or GMO. This is what I feared was to be happening since this corporation is not small. I had been trying to look for Kerrygold butter in Canada, and near the border in the US to no avail. Now I won’t look for it anymore. As for the need to give cows grain fiddlesticks! there is a nice dairy in BC Canada who do not feed grain at all, and is 100% grass fed, they produce cheese, but no butter (http://www.gortsgoudacheese.bc.ca unfortunately they do not ship to the US). Their Gouda cheese is simply fabulous! The winter in BC is a bit harsher than in Ireland, so there no grain needed. I think it’s incorrect to make such a sweeping statement. I have heard from both the owners of Claravale Raw Milk Dairy, and Organic Pastures Dairy, both here in California, that few dairy operations in the world are able to have cows on grass only year-round. New Zealand may be an exception. It also depends on the breed, the quality of grass available, etc. Lactation is very demanding on a cow’s body and she needs all the nutrition she can get. Most dairies supplement with at least a little grain. I’m all for encouraging demand for non-GMO, but we can’t let the good guys go out of business while supply chains are sorted out. Grass-fed is booming, as is demand for non-GMO grains and seeds, so it takes time for the supply to rise to meet increased demand. AARGGGH! I just do not understand this. Why would they ruin the number one reason for buying their product?! I will continue to proudly support Kerrygold! I did a lot of fact digging on them and other pastured butter choices and I feel confident feeding it to my family. We also don’t have an allergies to corn or soy (which *may* be feed as a small, small supplement in the winter when the cows aren’t producing). I use Trader Joe’s organic butter, which states grass fed. I’m not sure if it is 100% grass fed though. Have you looked into that kind yet? Our TJ’s organic butter does not say grass fed! interesting. Trader Joe’s Organic Butter is made with 100% organic milk from cows raised in fresh, green organic pastures, free to roam and graze at will – weather permitting of course! The family farmers that supply the milk for our Organic Butter feel a strong sense of stewardship toward both their land and their animals – they’re connected to the rural communities in which they live and committed to helping reconnect people to the food they consume. And since this butter is 100% organic, you can be sure it’s produced without the use of added hormones, antibiotics or chemicals. Just pure, fresh, delicious Trader Joe’s Organic Butter. Ingredients: Organic Pasteurized Sweet Cream (Milk), Salt. TJ’s Organic Butter is made with a touch of pure salt without colorings, flavorings or flowing agents. This minimally processed natural food can be use in baking, cooking or anywhere you wish to enjoy the unique taste of pure butter. I just read the description on the Trader Joes Organic butter – it no longer states is grass fed. The way they wrote it too as you quote above – they leave themselves an out for supplementation with grains. Hi Noelle! Are you providing a link that might help me find grass fed butter? If so, thanks! *Kerrygold Butter is made ONLY during the grass pasturing season when the cows are eating grass. It doesn’t bother me that they are fed silage during the winter because no butter is made from it. the Kerrygold Grass fed butter sold in the winter is FROZEN butter from when it was made when the cows are grass fed during the warmer months. If it’s better than Kerrygold then I’ll switch. I make my own Ghee by clarifying the Kerrygold butter which is still the best deal. *The Rumiano butter looks great and cheap but Azure only sells by truck delivery and they DO NOT deliver to New York or the East Coast. *Butter Oil sounds great but at $60 + shipping for an 8.1 oz. bottle which also has “natural flavor” added — I don’t think it’s worth it. Also I find it suspect that all their butter oils have flavor added like Raspberry, Pecan -which means the butter oil by itself must not taste or smell very good, perhaps due to the centrifuging. *** Are YOU paying $60 + shipping for this 8 oz. Butter Oil product and eating it everyday ? *Pure Indian Ghee grass fed Ghee is a good product. However it cost $11.95 + shipping for a 7.8 oz. jar. *That comes out to $24.51 per lb. Let’s say it’s $10 shipping for 2 jars, that would make this Ghee cost $34.51 for 1 lb. of grass fed Ghee. Interesting information from the rep., considering Kerrygold’s website does state that they supplement after calving in the spring. Their website information is very misleading, and I refuse to support GMO feed which is currently the Monsanto push in Europe. As for price we have found Anchor Butter cheaper than Kerrygold, but I am in CA. Some of the above comments say that Anchor Butter can be found at Walmart. Good luck with deciding what is best for your family! Why does Ghee lose the Wulzen factor? I thought Ghee was supposed to be the best butter out there. Sorry I don’t have time to read all the comments, but Anchor is now made from milk in the UK NOT the NZ grass-fed version – I;ve linked to this from the “website” field on this comment form which should turn my name into a hyperlink, the site is The Grocer .co.uk. Anchor butter stated that they have a ‘branch’ that is producing butter under their name in the UK now. That butter is NOT 100% grass fed. The butter produced in NZ is. Hope that helps! We use Smjor Icelandic butter which as far as I have found is 100% grass fed. Delicious, and nice and yellow. I do well with it, plus love the taste. Available at Whole Foods in the US, about $3.50 per block. Sale at times too. The whole thing is laughable. They said UP TO 3% of the feed they eat UP TO 25% of the time (the three months they cannot graze on pasture)….. so really, 0.75% of their food MIGHT be GMO, because they are in a part of the world with no choice. Three fourths of one percent. Or Less. Show me one company that guarantees better. And by your math, they only use feed 10% of the time, not the 25% another article claimed. So .10 multiplied by .25 equals. .025, or 2.5%, MAXIMUM that is GMO. I get the desire to be 100% GMO free. I would love that as well. But unless you know the cow you are getting your raw cream from (I do), you have no guarantee anything else is that close to perfect. Even pastured cattle are often pastured near neighboring ranches. And those neighboring ranches using GMO products affect your “perfect” cow. Ireland doesn’t have much choice in the matter, currently. It’s definitely good to be aware of, and push for change, find other resources, etc. But there seems to be a general backlash against an honest company, with a good product, for admitting they are not perfect. 99.75% is pretty great. I DO understand that for allergies, even that miniscule amount might be serious enough to avoid. And perhaps the rest of us can buy it from batches when they are NOT on supplemental feed (if we can figure out when that is). And ABSOLUTELY, consumers should be aware, and purchase according to their needs/wants/issues/etc. But vilifying a company based on flawed math is ridiculous. ANd unless the REST of your diet is 100% perfect 100% of the time, this is hypocritical as well. According to Smjor’s website (to the posters that feel better, because they use that instead), “During the bright summer days the cows are kept in the pastures, but are housed during 7-8 months per year. ” No where does it say they only eat perfect, non-gmo feed during those 7-8 months of confinement, but they are definitely not eating fresh grass (http://en.wikipedia.org/wiki/Iceland#Climate). Not attacking, just putting it in perspective. At least KerryGold is up-front and honest. A rare thing in business…… Look at Odwalla, Nakedjuice, and so many others that are not who they’ve claimed to be all these years….. I bought Kerrygold and OV Pasture butter and compared them side-by-side. Couldn’t see any difference in the yellowness, so now I’ll be sticking to OV. So glad I stocked up when I found them on sale for $2.50/half lb this weekend! I make clarified butter from Kerrygold, is there any reason to believe that the toxins from corn and soy will turn up in the fat fraction of the butter (Ghee) ? I can only ask that all of you go to their website and tell them that you will no longer be purchasing their product and why. Of course as other commenters have pointed out that the amount of GMO feed is actually very, very minimal, however we need to pressure these companies to do something about the laws in their area, this is how we can fight giants like Monsanto. If a company is losing enough money because their customers are dissatisfied, the companies will push for a change, and they will have much more power to do so than we as individuals. It only takes a few minutes to write them an e-mail. And it could make all the difference in the world. Also, you may want to change the link for anchor butter to http://www.buyanchorbutter.com/ because there is no information on how to purchase on their main website which you linked. I sincerely doubt that this claim can be substantiated as it pertains to Anchor butter. With regard to “New Zealand’s farms” it is totally and utterly false. “Supplementary” feeding is becoming more common than not. Grains of some type are common, so is palm kernel extract. I’m not sure how Fontera would seperate the milk from farms with and without supplementary feeding, and I’m not aware of this happening. Unless this claim is made by Fontera/Anchor itself, and not some reseller, I would seriously doubt it. If you’re concerned about this – personally I’m not, I’m ok with a little supplementary feed – than I would contact Fontera in NZ, or failing that Keith Woodford at Lincoln University as he would probably know. We use Smjor butter from Iceland. Whole Foods sells it. Kalona is not 100% grass-fed,their cows receive a diet of 20% grains during the winter months. Because they are certified organic, however, you can trust that the grains do not contain GMOs. Anchor butter is imported from New Zealand — land of reliably grass-fed lamb. It is not certified organic by the USDA, but the cows are out on pasture year round. New Zealand has very strict regulations for its cows, so this butter is happily hormone-free, antibiotic-free, and additive-free. In California, you can buy organic, raw butter from grass-fed cows from Organic Pastures Dairy in Fresno. Sprouts and select smaller grocers carry it. It’s not cheap: around $13 per pound as I recall, which is why I buy Kerrygold at Costco. I use butter mostly to cook with, so I can’t see any particular advantage to buying raw because I heat it in the cooking process. The OPDC butter also starts to “sour” (it develops a distinctly cheesy smell and flavor) before I can use it all up. I do, however, buy OPDC raw whole milk and their kefir! Anchor butter in the UK no longer comes from New Zealand cows. You can get true NZ butter on Amazon for $6.85 a pound to your door by FedEx….if that helps anyone. DO NOT settle for GMO’s at any level. They are not acceptable. Cabot tastes great, but I have an email to them about their product, grass-fed, GMO’s etc. I use Cabot Butter as well because I thought it was the best choice, but I just realized that Cabot lists “natural flavor” as an ingredient. I have no idea what that means since they don’t say, so that is highly disappointing! One benefit to Irish butter is that their cows could eat natural grass that is growing during our American winter; so, their is a skewed, seasonal benefit. The Unsalted Butter Wrapper does have the Natural Flavoring listed under its ingredients. The Rumiano Unsalted Butter ingredients are actually: Ingredients: Pasteurized Cream (Milk). rBST Free from Grass Fed Cows. Rumiano receives milk from 22 dairies located locally in Del Norte and Humboldt counties in California, which unique climate allows for year-round pasture grazing, on average 300+ days per year. During winter months, the cows are fed Silage or Haylage, cut directly from the farm, as well as small amounts of grain. If an animal product is not certified organic or non-GMO verified the animal may have been fed products that weren’t certified organic and weren’t non-GMO verified. Thanks for the information. Just returned a case of kerrygold to whole foods and registered a complaint about their selling gmo products. I am in california and am not able to find anchor butter here. Could you share your source please? I am so disappointed as well!! Thank you so much for posting this. We were buying Kerrygold at Costco, but they only carry the salted version, so I started wondering what kind of salt they are using because it doesn’t say sea salt on the package. During my search I came across your site and couldn’t believe what I was reading when I got to the 3% GM’s in the butter! Again, thank you very much! I just ordered some Purity Farms organic ghee. Apparently their cows are mostly pastured, but also fed some grain (including soy). Oh, well–not a perfect solution, but at least a decent and reasonably cost-effective one, considering that my local stores have completely run out of organic butter. Anchor butter is great!!! They also have a line of cheese made from the same cows milk under the brand Mainland. I live in Nova Scotia Canada & go down to NY twice a yr & always bring back KG Butter to get me through to the next visit. I have no allergies so I’m not concerned about the 3% & will keep buying it. I do the best I can by eating mostly organic items & stay away from all items boxed, packaged, or new & improved. I’m 75yrs old & have no health issues….I’ll just keep doing what I’m doing & enjoy live to the fullest….. Butter quality can also be easily tested by it’s softness. While at the store you can gently squeeze the butter and see how soft they are. The higher the quality, the softer it will be. This assumes your tested butters are are all at the same temperature, so don’t compare room temperature to refrigerated butter. I still buy Kerrygold as it is always softer than the other commonly available pastured butter such as Organic Valley, whom I have little faith in. Another test for quality is the depth of the color, white = bad, yellow/orange = good. Lastly, flavor, low quality butter lacks flavor and aroma. This is certainly a big disappointment. I started with KG back when I read ‘the 4 hour body’. His diet helped me get a six pack, at the age of 47. Time to find a better replacement. Ha! They removed it, huh? I will dig further. Thanks for letting me know. I live in Ireland and as I type this I can see the cattle outside eating GRASS, where we are there are NO corn fields and if there were, they would not be what you call corn, (we call it maize) and very few cattle even get to see that much less eat it, I am sure that statement was more of a legal requirement than an all encompassing fact, based on the very worst winter conditions (which are quite rare.) The vast majority of butter is produced in the growing season, when feed supplements are not required… I for one would not get paranoid or fanatical over it, if you are concerned about getting the best available, then you are on the right track with Kerry Gold..
It’s why I haven’t stopped buying it…. You do realize the point of her blog is for families with children who have food allergies right? She’s not being “paranoid” or “fanatical” in any way when her child reacts to the butter, from a cow, that may have eaten a tiny bit of soy or corn sometime during the year. Just because you see it eating it now, doesn’t mean you’re watching it all the time. Buy whatever you want, but when you have a child like ours, these food choices are a matter of life and death. Not of convenience. While it is true that you can have 100% grass fed beef. It is not possible to have 100% grass fed milk nor butter made from that milk. Take it from an old farmer. Why the difference you might ask? A beef cow is allowed to stand in the pasture from the day it is born until the day of slaughter. Hence 100% grass fed. Milk cows are taken off the pasture twice per day and brought to the milking parlor where they must stand still in a stall to be milked. Animals do not like to be confined even for the short period needed for milking. To get the cow to stand still, farmers devised a clever plan. They give the cows a small amount of feed for them to eat. If you give the cow hay and they are fnot hungry they will not stand still so you do what many parents do to children they need to keep still, they give them candy. In the case of cows the most convenient is hay, corn leaves, oats, soy beans and other item, beat into small particles and mixed with molasses. It is placed in a small container ( about one quart per feeding). The cow comes in the stall, and starts eating. The milking machine is attached and the milk withdrawn by the time the cow finishes eating. Less stress on the cow and the farmer. Knowing this and looking at KaryGolds reply, I think ther are doing an excellent job so I will continue to purchase their product. I also hope people read this far down so they understand the change in the web site. Disclaimer: I have no relation with KaryGold except as a satisfied customer. Sorry to hear that someone would spread the “myth” that Irish Dairy Farmers feed corn (Maize), which is not grown in Ireland, to their dairy heards. The predominant grain crops grown in Ireland are wheat and barley. Secondly Ireland is very unusual in that it enjoys 4 growths of grass thoughout the 12 months of the year allowing cows to “Graze” outdoors year round. Ireland enjoys a very mild climate and the grass is always green. Milch cows need to graze on grass in order to produce milk. It’s important to draw a distinction between “Milch cows” which are female and Beef cattle which are predominantly male. Ireland is one of the largest producer of Beef in Europe. On another note “Jersey cows” are a very much a boutique breed in reland. The dominant Milch herds are called “Fresian”. With regard to the use of “GMO’s” in Europe the decision is left up to each member state to make it’s own decision to allow or not. The article does not state that Ireland grows GMO corn. Kerrygold acknowledges that they *import* feed from the United States, like much of the European countries. It is a myth that milk cows must be fed grain. It varies depending on breed. In fact, the Irish Dexter cow is known for it’s ability to require only grass. The use of GMO seeds are “Banned” in the Republic ofIreland and Northern Ireland. Actually growing it is banned. The regulations on use continue to change. You can check with GMO Free Ireland for the latest information. That is who I consulted when writing this post. Interesting, I contacted kerrygold and they said that their cows are fed gass and hay in the winter. Only a very small percentage of supplements is used just like any grass fed cow. Hi Marlena. I am glad to hear they are still being forthright in admitting they supplemental feed. Did you know that not all cows must be supplemented? Depends on the breed. Kind of interesting. Let me correct a misperception on grain feed. Kerrygold purchases it’s milk supply directly from farmers. It is not in the grain feed business either as a buyer or supplier.The notion that Irish farmers purchase corn feed from the US is nonsense. Irish Milch cows graze on geass pastures year round, given it’s mild climate and all year round grass growth. Kerrygold is in the business of butter. Yes. However, Kerrygold USA does answer questions about where the cow feed is sourced from, and their response was that Ireland does not make enough grass to feed all the cows and so they must import silage. You are welcome to email them directly and ask, just like I did. Since this is a severe food allergy concern, it is important to get this information correct or it could put people at risk. GMO Ireland is also a great source for the current status of GMO’s in Ireland. I just wanted to add to this good info that has been posted here: GMO crops like corn and soy are heavily contaminated with Roundup. The purpose of their modification was to allow farmers to overspray the entire field with herbicides; the entire field includes the growing crops, which have been modified to withstand the herbicide. Filling our guts with these grains kills off our good gut bacteria and results in poor health throughout the body. Imagine feeding your little children this poison. Check out Autism and the relation to gut health. Agreed! Both on Roundup (which is so incredibly harmful) and on the mass production. Fishy indeed. The issue of fluoride in my meat, butter, cheese, etc. has never occurred to me, but my goodness it should have! Thank you for the insight. I met a dairy farmer on a trip to New Zealand, the cows are 100% grassfed all year round BUT ….. the grass is sprayed with pesticides by light aircaft ,they are not supplemented with grains as uneconomical but hay. Small farms tend to not spray and are organic but not for commercial production. New Zealand butter, (Anchor) is no longer from New Zealand in the UK, or the EU. The EU stopped the import of New Zealand Butter. I to went to the link that you provided and it states that the products of Kerrygold do NOT contain any GMO of any kind! I found it under the link that you had under Kerrygold, and the frequently asked questions section at the bottom of the page. I am so excited for I just found this butter at my local health food store. The article actually states that Kerrygold feeds their animals GMOs, not that they add GMO corn or soy to their butter as an ingredient. Because animal products are composed of what they eat, that means that those allergic to corn or soy, or who wish to avoid GMOs, would benefit from this information. Kerrygold has also changed their website since this article was originally posted in 2013 and to obtain this information you need to email them and ask them directly. Already year ago I checked Kerrygold’s webpage and realised that actually they don’t promise you 100% grass-fed and 100% pure butter. GMO-free butter neither. No statements, promises about most important things for consumer. Hi Marica! What ancient breed cow do you use?? Hey folks, Greenland is icy and Iceland is green, they did that on purpose. According to the latest press release on the Kerrygold website: Cows are entirely grass-fed. That is interesting. Got a link? I can’t imagine that being remotely true. They export way more now than they did when this was published in 2011, and at that time they claimed they were required to import feed because they could not keep up with demands. They do claim cows are completely grass fed during the spring months, though I am not sure how you would guarantee you are getting that butter when its now being sold on the shelves of Costco. Regardless it still isnt organic. If you are dealing with sensitivity to grain, corn, soy or GMOs, or have other immune inflammation, then you will want to steer clear of anything that is not organic or comes from a GMO related source no matter how small.